Garuda is also heavily symbolised as a figure of the Sun, hence images of the Sun or temples of the Sun (as seen in the logo) characterise this website. Because of his equivalence with the Sun he also grants great knowledge of Jyotish or Vedic Astrology. The name for this site was chosen, as it was the same name that a father prayed to back in the year 1509, to gain a son who ended up changing my life in the present. This son was Sri Achyuta Dasa, one of the five disciples of Sri Chaitanya Mahaprabhu (said to be a partial incarnation of Sri Krishna/Sri Vishnu). As a disciple he acted as head astrologer/Jyotisha, and taught 12 students the aspects of seeing the past present and future. The village Kakatpur in Orissa still continues the work of Sri Achyuta Dasa, by offering readings to all those who come. The reader is said to speak the words of the 12 students by worshiping and reading of copper plates imbibed by the knowledge of the 12 students. These students, in turn, taught their students, and somewhere along the line, this was taught to Sri Jagannath Rath, who later went on to become the Jyotish Ratna (the highest title of an astrologer) of Orissa (May 11th 1935). Jagannath Rath was a very serious worshiper of Shiva, to the extent that he kept his penance secret and later became a Shaivite Sanyasin. His knowledge of Ganita (mathematics and astronomy) was superb and he would calculate the Vimshottari dasa down to the sixth level of Deha-antaradasa for predictions using no more than his finger-tips and the ephemeris. All this done with a slate and chalk only, as paper was very expensive for them in those days. He has authored a few books both about Jyotish and about the benefits of being vegetarian, which today are not easily available to the public. The Ratha’s belong to the lineage of the seer Atri, and besides being renowned for their mastery in worshiping Shiva, Atri is also one of the three seers of the AUM or OM, and the fifth mandala of the Rgveda is dedicated to his lineage. The Ratha’s originated from Gujarat where they worshipped Shiva at the Somanatha Jyotirlinga. They later left Gujarat and came to Orissa where they stayed in Bila Balabhadrapur Sasan. For more information on the Rath lineage click here: Rath Lineage. Jagannath Rath, then taught his son: Kasinath Rath. 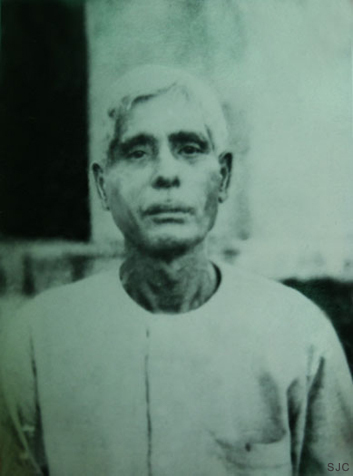 Kasinath Rath worked in the government service and was the eldest son of Jagannath Rath. He would conduct informal classes on Jyotish with his close students and in these his nephew Sanjay was among the brightest in the class. Kasinath Rath initiated Sanjay into the Gayatri Mantra, which Kasinath took very seriously. Sanjay remembers his uncle as very strict, and very meticulous. He often remembers how his uncle would spend an entire day calculating and preparing a chart for a consultation. He would prepare the Astakavarga in detail using mantras to remember each dot placed in the chart by each planet. He could recite the entire Brhat Parasara Hora Shastra from memory and would qoute slokas from it to justify examples. His main contribution to Sanjay Rath was the Jaimini Upadesa Sutra. Pt. Sanjay Rath is Visti’s Guru and founder of Sri Jagannath Center (1998). He is one of the first to bring the traditional knowledge of Vedic astrology from the tradition and into the public scene, just as his Grandfather did before him in Orissa. Sri Jagannath Center teaches a large number of students across the globe, through informal online correspondence, in-person conferences and workshops each year. Setting his higher studies aside temporarily, he travelled to attend and present papers at several conferences and workshops across the USA, UK, Serbia and India. Studying solely through the Shri Jagannath Center, Visti was among the youngest selected to be a teacher by his Jyotish Guru and has spent considerable time at Jagannath Puri, Odisha as well as New Delhi learning personally with his guru. Completing a Bachelor’s Degree in Linguistics, he has since dedicated all his time to teaching and practising Jyotish. Under this tutelage, he has since earned the title of Jaimini Scholar after completing the five-year Jaimini Scholar program. Following his completion of the program, his proficiency and dedication to the program entitled him to be the caretaker of the Maharishi Jaimini Krtam Upadesha Sūtra and the head of the Jaimini Scholar Program. His teaching style is clear, thorough and systematic. Having a passion for teaching, his dedication for the topic becomes evident as he creates the building blocks for his students to climb. His students are located in several different countries, comprising mainly the continents of Europe, the Americas and South-east Asia, whilst his clientele represents almost all corners of the globe. Besides his efforts within the Jaimini Scholar Program, he runs RAMA, the Regional Academy for Mantra and Astrology wherein he holds courses and monthly webinars on various topics of Jyotish.